We discovered that the radio sources… I was given the task also, as well as my own project, I mean, Martin Ryle got people working on all sorts of different things – I was given the task of analysing the data from some of the very first sky surveys and I noticed that some of the... some of the sources… we knew about four radio sources then: Cygnus, which you know all about; Cass A; The Crab, and Virgo. And I was analysing these data and I realised that they had a fluctuating signal, which only happened at night. And that was a bit of a problem, and I then discovered that this was correlated with an ionospheric disturbance called spread F. You know, Ratcliffe was… and his students were investigating the ionosphere by getting radio waves reflected from it, that was the standard way of doing things in those days, and I saw a connection then between this scintillation and the ionosphere and decided that why don't you investigate the ionosphere using radio waves from outside, from… from these things, whatever they were. We didn't know what they were. And I suddenly saw here was an opening which was a kind of new line of research and I would be the first person in the world to actually know what the atmosphere was doing at 150 miles above the surface of the Earth, because by reflection, you can only get the bottom of the ionospheric layers. With radiation from the outside you'd go all the way through. And if there's any way of detecting what's going on in the upper atmosphere using radio waves from outside, that's… that's a brand new thing to be doing and I could understand all that. And I got going on that. And that really triggered me off. I mean, I got a paper written on that. First of all, I had to understand the theory; it's not obvious what happens when radio waves pass through an ionised plasma and I got involved with that… that bit of theory. And it's diffraction theory, actually, finally, and wrote a paper about this, and I thought it was pretty straightforward. But when Jack Ratcliffe read the paper he said, 'Hey, this is pretty interesting, you ought to publish this.' And that set me going. I mean, I had a first published paper after two years in… in research and that really set me on course. I mean, I had an achievement which… which was mine. When you're starting off in research everybody knows much more than you do about things normally and you… you feel you're not going to make much headway. And especially that was true in radio astronomy when nobody quite knew what they were doing anyway, but I suddenly… suddenly something… something clicked and I decided I'd got a paper. Ratcliffe said, You should publish that in the Royal Society, Proceedings of the Royal Society. I began to feel a little bit more important rather than just a kind of cog in the wheels. And that… that got me going and that set me on the course actually which defined my whole research career, actually, because that scintillation led on, step by step, eventually to the discovery of pulsars. So that's… that's how it all began, as far as I was concerned. 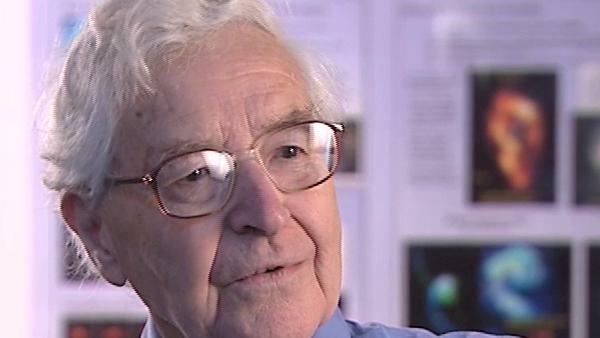 Born in 1924, Antony Hewish is a pioneer of radio astronomy known for his study of intergalactic weather patterns and his development of giant telescopes. He was awarded the Nobel Prize for Physics in 1974, together with fellow radio-astronomer Sir Martin Ryle, for his decisive role in the groundbreaking discovery of pulsars. He also received the Eddington Medal of the Royal Astronomical Society in 1969. Dave Green is a radio astronomer at the Cavendish Laboratory in Cambridge. As an undergraduate at Cambridge his first university physics lecture course was given by Professor Hewish. Subsequently he completed his PhD at the Cavendish Laboratory when Professor Hewish was head of the radio astronomy group, and after postdoctoral research in Canada he returned to the Cavendish, where he is now a Senior Lecturer. He is a Teaching Fellow at Churchill College. His research interests include supernova remnants and the extended remains of supernova explosions.